Although I’m a British Showjumping Coach I’m very much representing the grass roots riders, as a one-horse rider with a wilting money tree we have all the normal eye rolling set backs. However, I’m very lucky to be in a position that I care share my experience with others, watching other partnerships grow takes the edge off missing a show because another shoe has been launched into the closest bush! Horses are the greatest at grounding us and when people are going through their one step backwards it’s so rewarding to help them both take those two steps forward again, if you can get the horse and rider having fun and believing in each other there’s no stopping them! Being a brand ambassador for such a great company would help me not only improve myself but in turn help so many others! 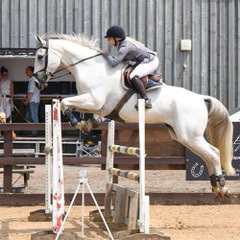 I’ve been picked by Forces Equine to ride in their teams at Blenheim, Hickstead, Scope and even across the water in Jersey and won 3 awards for team spirit, most dramatic performance and at the drop of a hat at their annual dinner last year. I’ve worked with a wide variety of horses including breaking/ producing/ reschooling and rehabbing horses that are on the international circuit to local grass roots natives. As a BS coach, I pride myself in bringing enjoyment of the sport to both horse and rider, whether it’s building confidence or getting to the nitty gritty of technical work.